Railpictures.ca - Dave Beach Photo: Morning fog is just burning off in the Don Valley as 2 SW1200RS’s lead a local freight under Lawrence Ave. We were there waiting for the ONR train coming in and got a pleasant surprise when this freight rolled through first. | Railpictures.ca – Canadian Railway Photography – photographie ferroviaire Canadienne. 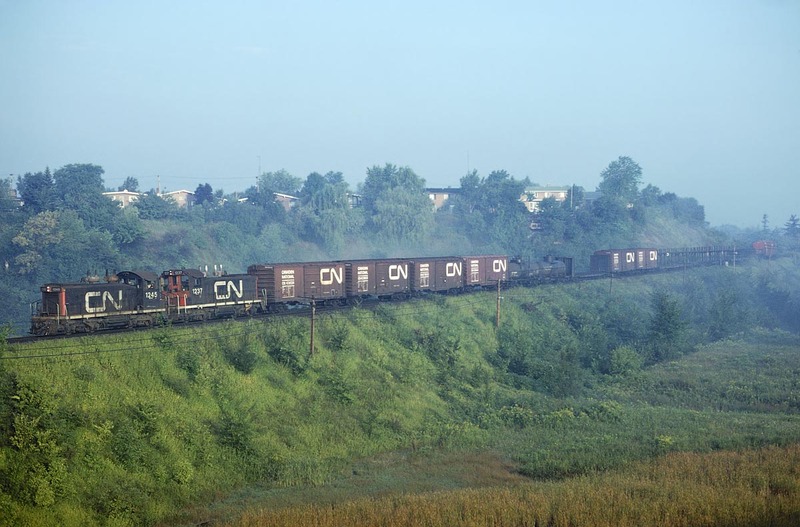 Caption: Morning fog is just burning off in the Don Valley as 2 SW1200RS's lead a local freight under Lawrence Ave. We were there waiting for the ONR train coming in and got a pleasant surprise when this freight rolled through first. Interesting how the 1200′s are running back to back as CP did. Normally they were nose to nose. Look at all those noodles. Great shot! 1200′s, 40′ box cars, stubby tank cars, then further back what appears to be open sided bilevels. Definitely a 70′s rail photo. Nice one Dave.